During the 1930s, Emily Carr's sketching trips were to the areas immediately surrounding Victoria, such as Goldstream, Langford, Sooke and Metchosin, areas where small farms were often to be found. In the early thirties, Carr would rent habitations such as rough cabins and cottages to position herself in her sketching locations. Then, in summer of 1933, she acquired a caravan trailer, which she dubbed The Elephant. This gave her more freedom, since she could have it towed to various countryside locations. Outfitted specifically for her needs, it provided a cozy base for her and her animal companions. Her first outing with The Elephant was in May of 1934, when it was set up beside Esquimalt Lagoon in Metchosin. After getting swamped by rain, it was hauled further up Lagoon Road into a dry, sunny field owned by Mr. Strathdee, a Scottish farmer. With coastal views, open skies, woods and farmland, Metchosin became an important painting place for Carr. Her summer outings in The Elephant continued until 1938, when she sold it due to health concerns. That same year in July, she rented a cottage on a dairy farm on Telegraph Bay Road in Cadboro Bay, near Victoria, owned by Mr. Godfrey. Edythe Hembroff-Schleicher wrote that "the pastoral, idyllic setting of the Godfrey farm, so close to the dark blue waters of the Strait of Georgia, made it the most scenic and delightful of all Emily's sketching sites." The Vancouver Art Gallery has a similar work entitled Mrs. Jones' Farm, which has a circa date of 1938. While it is hard to know exactly which farm setting this work was produced from, what is certain is that it is a quintessential rural British Columbia scene. Languid, summery, with a view to the ocean and mountains from a grassy field, the work pulls the viewer into its peaceful ambience. One of Carr's primary concerns in the 1930s was the depiction of energy in the natural world through a unity of movement, and here this energy rolls through the fields, gathers in the trees and beams up into the sky. As she stated in her journal Hundreds and Thousands, "One must be careful about the transition of one curve of direction into the next, vary the length of the wave of space but keep it going, a pathway for the eye and the mind to travel through and into the thought...Now I see there is only one movement. It sways and ripples. It may be slow or fast but it is only one movement sweeping out into space." What we see here is the essence of Carr's process. She felt deeply what she saw - sensing the unseen energy present in all living things - meanwhile rationally reflecting on how best to show this. To emphasize this movement, Carr used streaks of white paint sweeping up from land to sky, where rippling strokes of blue vibrate. To accomplish this flowing, vibrating movement, Carr used the medium of oil on paper, in which she thinned oil paint with turpentine or gasoline. This allowed her to use long, sweeping brush-strokes and more transparent effects. She also allowed the paper to show through, which over time has turned orange, adding an element of warmth to these paintings. It also stands in contrast to her streaks of white paint, making us more aware of them, and is another element of unity running through all the parts of the image. 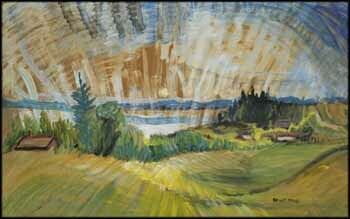 This is an outstanding painting from Carr's 1930s body of work in and around the Victoria area. It conveys both the warmth and intimacy of the small-scale farm and the expansiveness of the panorama of sea and sky. Glowing with a palette of rich greens and blues accented with touches of red, and expressive of radiant energy through Carr's powerful brush-strokes, Farm, Sea and Sky makes a strong visual impact.